I now have 2 talented team members (advertising for a third) who have helped to shape all of the various work that’s left the office and landed in clients inboxes this year. I’ve been very lucky to work with so many diverse clients on so many different projects and I’d like to thank them all for all of the support in 2017. In a previous blog post, many moons ago – I mentioned that I no longer consider myself to be a freelancer. Over the next few weeks, this site will be undergoing some changes to reflect that. In the past, I’ve struggled with the idea of being perceived as a customer-facing ‘studio.’ Studios charge high prices, have long lead times, and involve lots of red tape in getting projects started. I’d also been a little put off by memories of university peers buying a domain and registering a £12 LTD with Companies House to present themselves as a ‘Design Studio’. It seemed disingenuous. I’ve always wanted to keep my business very fluid, taking on projects at a moment’s notice, turning them round quickly, and keeping my freelance roots. But from the start I’d always set the point at which I would ‘become a studio’ at registering my company for VAT; I felt it was proof that I was running a successful business. 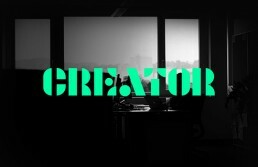 For all the reasons above, we’ll now be trading as Creator. True to the dictionary definition, I’ve always tried to be “a person or thing that brings something into existence.” Another reason for choosing this name is that both my surname Carter and the noun Creator both spell CRTR (the registered name of the business) if you remove the vowels. I’d always considered this when I’d registered my company so it’s not entirely serendipitous (promise!). Over the past 12 months, all of the work that’s left the studio has been directed by myself (any one of these photos could be me), and the work that leaves Creator will remain the same. I remain involved in projects start to finish. We intend to be, first and foremost, a flexible design studio. The principles of freelancing helped me build Creator from the ground up, and I’ll never turn my back on them. However, over the last year, the amount of work that’s left the studio has increased considerably. And as a result of this growth we’re now obliged to register for VAT. This means we will be adding VAT at the prevailing rate to all invoices from January 2018. Of course, it goes without saying that without all of my wonderful clients, my business wouldn’t be thriving – So I’d like to thank you for your continued support again, and extend my support for your business in 2018 on behalf of myself, and the team here at Creator.